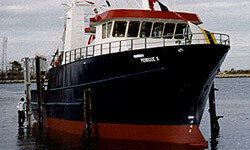 ‘Monique L’ is the latest Peter James designed New Generation prawn trawler which makes the 14th vessel in its class, in fact the second successive New Generation 22 metre prawn vessel to be named ‘Monique L’, and the third vessel in the Kolega family by that name and was launched on the 3rd of November, 2001. The Kolega family chose a Caterpillar engine package, having a long and satisfactory association with Caterpillar in their fleet, and liking both the availability of spares and service, as well as their proven economy, and accessibility. The main engine is a Caterpillar 3408TA marine diesel rated to 272kw at 1,800rpm fitted with a 6:1 reduction Twin Disc 516-6 gearbox. Propulsion is by a 1,800mm diameter Veem fixed pitch propeller within a nozzle. 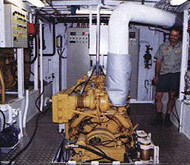 Auxiliary power is provide by two Caterpillar 3056TA series six cylinder in-line generator sets rated at 100kVA each. The engine room layout is clean, well lit and spacious, with adequate room for maintenance and service work when required. The highly respected SA company CE&A has supplied the keyless rudder carrier bearing and tiller arm assembly, and the vessel’s plumbing was installed by Fluid Plumbing. Refrigeration was supplied and installed by Heithersay from Port Adelaide, with two Bitzer rotary screw compressors with oil cooling and R507 refrigerant. The refrigeration and chiller system were provided, and installed by CM Heithersay Industries utilising two Bitzer rotary screw compressors with oil cooling and R507 refrigerant. All the pipe work is stainless steel, and the low temperature evaporators are fitted with Danfoss electronic TX valves. These compressors return excellent performance, and are said to be proving superior to the reciprocating type at low temperatures. The boat carries in excess of 20 tonnes of frozen product, with the air blast snap freezer taking the 240 ten-kilo boxes down to -40C. 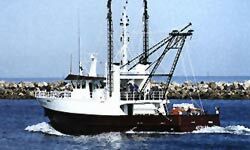 The vessel will be equipped with a state-of-the-art Haldane sorting machine and hopper on its arrival at Port Lincoln, allowing the prawns to be graded into seven sizes. 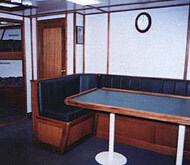 The wheelhouse and all accommodation is air-conditioned, with the distinctive Danta woodwork setting everything off in a traditional and seaman like manner providing comfort to the crew of 5. 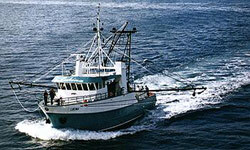 Electronic equipment was supplied by Taylor Marine of Port Adelaide, and includes a Furuno FR-7112 72nm 25kVA daylight viewing radar, Furuno FCV-291 colour sounder, two GPS GP-31Navigators, a Furuno GD-280 colour plotter, a TMQ autopilot and TKC GM-21 gyrocompass. 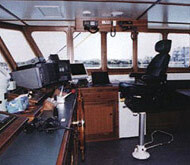 There is also a Kobi CM 100×4 colour monitor allowing complete coverage of the engine room from the wheelhouse utilising two Toa C-CC354 cameras, and an additional Toshiba laptop combining sea plot facilities.